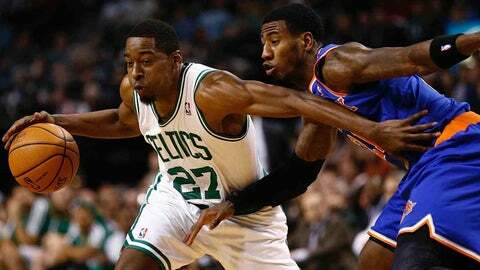 Rajon Rondo and Jordan Crawford on the trading block? The last time Rajon Rondo was on an NBA court, he was leading the league in assists and on his way to a fourth straight All-Star game selection. Eleven months later, Jordan Crawford is having a career season by just about every measure and may have rescued his NBA career. And across the Internet, rumors abound that the Celtics are willing to trade both players for virtually nothing. It should go without saying just how absurd some of the scenarios that have been floated are. Unfortunately, it can’t. Welcome to trade season, when anything goes as long as it fits into the ESPN Trade Machine — and, oftentimes, even when it doesn’t. As of Dec. 15, teams have been allowed to trade players acquired via free agency last summer. There was no movement on that front over the weekend, but there was plenty of talk, and the Celtics were not immune. Several reports popped up about the Miami Heat, in search of backcourt help, being interested in Crawford. Then came Tuesday’s report about the Celtics and Kings being close to a trade that would send Rondo to Sacramento. In related news, the Grizzlies are selling stakes in their lovely new oceanfront stadium in Memphis. On some very shallow level, both Crawford to Miami and Rondo to Sacramento make some sense. In Miami, Dwyane Wade no longer can be relied upon to suit up every game, and Crawford has shown he can play either guard spot. In Sacramento, DeMarcus Cousins has clearly emerged as a franchise star, and pairing him with a backcourt mate of Rondo’s caliber would give the Kings a point/big duo to rival the Clippers’ Chris Paul and Blake Griffin. The deals would be instantly beneficial to most of the teams involved — just not the Celtics. It’s important to remember that a trade has two sides. Celtics fans are as guilty of this as anyone; we haven’t forgotten all those Fab Melo trade proposals the green teamers cooked up a year ago. Let’s start with the Heat, who are reportedly going into their search for a guard by dangling the immortal Joel Anthony, complete with a 0.6 points per game average and $3.8 million player option for next season. The Rondo scenario might be more or less attractive, depending on how one judges the unspecified "players" coming back to Boston in return. Now, if said "players" include the not-Michael-Jordan avatar "Roster Player" from the Chicago Bulls’ lineup in NBA Live 98, the Celtics might bite. Ol’ Mr. Player was pretty unstoppable in his No. 99 jersey. Otherwise, come on. Really. Ever since Celtics president of basketball operations Danny Ainge fessed up to this being a "rebuilding" year during the offseason, observers have been obsessed with the notion that the Celtics are willing to just sell off all their talent, regardless of the return. Using such logic, Jeff Green and Gerald Wallace "have to" be traded — no discussion of to whom or for what — while both the current and long-term starting point guards can be dealt for vague offerings that bring the Celtics nothing of consequence. Those who believe Ainge and the Celtics are willing to sell their best assets aren’t wrong. They’re just missing a key wrinkle. Ainge, like any executive, would gladly deal away Green, Wallace, Crawford and even Rondo for the right package. That means draft picks, young talent or imminent salary relief that still allows the Celtics to field something resembling an NBA lineup in the meantime. Because the Celtics do, in fact, still need to play the games between now and the draft. None of the reported deals accomplish this. Swapping Crawford for Anthony adds another body to stick at the end of the bench with Keith Bogans while robbing coach Brad Stevens of his one player capable of handling the ball and running the offense to any extent. Dealing Rondo to the Kings saddles the Celtics with something like Marcus Thornton‘s $8.5 million salary next season to make the salaries match. Neither of those proposed deals help the Celtics now or in the future. So why would Ainge consider them? He wouldn’t. Now that all restrictions on trades are lifted, executives across the league will be presented with offers they will need to weigh with a cold, discerning eye. Ainge will be no different. But he, like his colleagues, will also be presented with unworkable or inexplicable scenarios cooked up in some bored person’s mind. For now, those are the only types of trade rumors involving the Celtics that appear to exist.